LANSA doesn't lock us in. LANSA is multi-platform and future-proof. E.P. 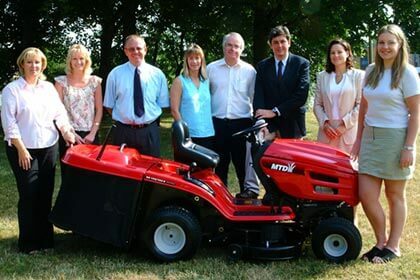 Barrus Ltd, located in the UK, designs and manufactures engines and distributes a diverse range of products including MTD lawn and garden machinery, moto-roma scooters and motorcycles, Mercury, Mariner and Yanmar marine and industrial engines. Barrus uses LANSA Integrator to exchange EDI messages with its trading partners including B&Q, the largest do-it-yourself chain in Europe and the third largest in the world. Barrus has also more recently implemented a dealer website built with LANSA's customer self service solution, LANSA Commerce Edition. The site also uses LANSA Integrator to exploit web services offered by Epitomy, a company who specializes in exploded diagrams. The site allows dealers to order parts, check stock availability, track order status and view order history. One special feature of the site is that it allows dealers to search for parts without having to know the part number. Barrus does this by using LANSA web services to link to and pass parameters to Epitomy's website. Dealers can select the diagram of the engine and dissect it till they arrive at the part they need. Once the part is selected, a SOAP message is relayed back to Barrus' website, where the dealer can continue with the order. The graphic search of part numbers is a handy feature, as Barrus offers over 400 000 items on their site. Behind the scenes, Epitomy uses web services to request validation of the dealer number in Barrus dealer system. The dealer typically creates a parts list in the Epitomy site, using web services to obtain current stock and price information from Barrus. Once the part list is complete, web services are used to pass this list back into Barrus' dealer site, where the parts are added to the Quick Order page. The dealer then continues with the order as normal. Dealers can switch between the two sites at any time. As both sites have the same look and feel, the transition is smooth to the dealer. E.P. Barrus Ltd, located in the UK, designs and manufactures engines and distributes a diverse range of products including MTD lawn and garden machinery, moto-roma scooters and motorcycles, Mercury, Mariner and Yanmar marine and industrial engines. Barrus uses LANSA Integrator to exchange EDI messages with its trading partners including B&Q, the largest do-it-yourself chain in Europe and the third largest in the world. Dave Hansford, IT Manager at Barrus, says, "With LANSA we have the flexibility to accept and send business transactions in a variety of formats, using many different communication methods. LANSA is easy to use and complements our existing skill set. We want to run this IT department with our own staff. LANSA hides the complexities of EDI and XML and allows us to implement new technologies rapidly." LANSA hides the complexities of EDI and XML. B&Q approached Barrus, as they were interested to carry several of Barrus' ride-on lawnmowers and associated accessories. B&Q has stores in virtually every town or city in the UK and Barrus has a wide network of dealers for warranty and after sales support. A deal between the two companies would be very exciting from a business point of view. One of B&Q's requirements was that they would only conduct business via EDI. Barrus had a dial-up connection infrastructure in place for its dealers to place orders, but hadn't implemented EDI yet. Hansford says, "I only had 3 months to get a new EDI system in and working. The agreement with B&Q started just before the winter, a slow season for lawnmowers. We had to be EDI ready by spring, when the number of orders was expected to drastically surge." EDI was the most urgent concern, but not the only one. Barrus' customers include dealers, small shops, large retail chains, manufacturers and the Ministry of Defense. The wide variety of customers meant that Barrus needed a flexible system that was capable of handling a wide range of options for exchanging business transactions, such as XML, EDI, CSV and other formats. Barrus has an IT department of five staff and was looking for a single solution that would allow for EDI, XML and other transaction formats to truly integrate with their ERP GEAC System21 core iSeries solution, and that would not require specialized Java skills. "The margins in our industry are very tight. Increasingly we need to work harder for less and efficiency is becoming even more important. Technology plays an important role in achieving efficiency for us. We don't have time to do technology for technology's sake. There has to be a business reason to implement new technology and it has to give a return on investment." "We looked at a few specific EDI solutions, but they were very expensive and not flexible. I had seen LANSA Integrator some time ago, before the B&Q deal came along. We have been using LANSA for many years in a client server environment to our dealers. It allows our dealers to send their orders from a Windows environment over a dial-up-line straight into our iSeries. These orders are in an internal order format. Now we need to deal with third parties using various connection mechanisms including dial-up connections to a VAN and the Internet." "I was impressed with LANSA Integrator, because it runs on the iSeries and doesn't require data transfers to Windows-based systems. LANSA Integrator could also handle a variety of transaction formats." LANSA's Professional Services Group in the UK developed a highly configurable EDI framework solution for Barrus, that is based on LANSA Integrator, fully database driven and allows for multiple messaging standards, such as Tradacom, EDIFACT D99B and D96A, X12 and CSV. It also allows for multiple transport mechanisms, including EDI-INT using AS2, email and Value Added Networks (VANs) such as Tradanet. Exchange types and trading relationships can be quickly and easily added as well. For the B&Q implementation, the EDI messages are exchanged using the Tradacom v8 messaging standard, a UK based standard designed for domestic trade. Barrus configured their system to automatically dial up to the Tradanet VAN every hour. Any incoming messages awaiting retrieval are then transferred to Barrus' iSeries, validated, translated and the data stored in the database. On completion of a successful retrieval, the original message on the VAN is deleted. All tractors ordered by B&Q are supplied directly to the end consumer on a ‘personalized home installation' basis via Barrus' extensive dealer network. Barrus' dealers also provide the after sales support and warranty services. Therefore each incoming EDI order is matched with the nearest by dealer. That dealer is then informed of the order and the order is processed into System 21, using a customized EDI interface. Pending full implementation of their SAP system, B&Q required that, for the time being, order confirmations be sent in Excel format via e mail. Barrus uses the LANSA Integrator solution for this as well. After the dealer has delivered the mower to the consumer, demonstrated how it works and assured that the warranty papers are filled out, the dealer confirms delivery details to Barrus. The LANSA Integrator-based EDI solution extracts the invoice and delivery data from the GEAC System21 invoice interface tables, validates it and converts it to the Tradacom v8 invoice message format. These messages are then sent to the Tradanet VAN for retrieval by B&Q. Hansford says, "This was our first EDI project and it went very well. Together with LANSA we delivered and implemented the solution on time and on budget. LANSA Integrator provides a flexible solution and a single interface to our existing system." EDI is speeding the cycle of ordering, delivery and invoicing and saves time and labor. Tara Glen, company director and great-grand-daughter of the original founder of Barrus, says, "The accurate and timely flow of information between B&Q and Barrus allows for a very beneficial business scheme. Our market share has increased and by involving our dealer network in the program they have increased their number of service customers." "With our program B&Q does not have to keep stock and Barrus takes on the entire administrative function. All warranty work is handled through the dealer, and because the dealer has made direct contact with the consumer, the consumer will normally contact the dealer in case of problems or questions. This ensures that the consumer receives a quality product with quality personal service." "EDI is speeding the cycle of ordering, delivery and invoicing and saves time and labor," says Hansford. "We want to extend the system to cover trading relationships with more customers, dealers and suppliers. We are shortly going to start using EDI with the Ministry of Defense (MOD), this time EDIFACT D99B will be used for the messaging standard." "We are also considering using LANSA Integrator and XML to exchange transactions with our dealers. We have more than 1,500 dealers and the number of orders they generate, especially in accessories and spare parts, is substantial. So the savings would be substantial as well." "With LANSA Integrator there is no need to copy data, with its associated conversion and synchronization problems. The iSeries is so solid and reliable, that you almost forget it is there. But, even though we have no plans of moving away from the iSeries, it is good to know that LANSA doesn't lock us in. LANSA is multi-platform and future-proof." "LANSA is easy to use and complements our existing skill set. Hiring a Java programmer does not make sense, because without any business knowledge this person would not be able to design and integrate business solutions. We want to run this IT department with our own staff. LANSA hides the complexities of EDI and XML and allows us to implement new technologies rapidly," says Hansford. Our market share has increased and our dealers have more service customers. "This contract repositions us as the UK's leading supplier of garden tractors, therefore the ability to trade using EDI was crucial," concludes Glen. "In addition, with the nature of business as it is today, we have to process more orders, more efficiently, just to stand still. I am looking forward to reaping further benefits from our EDI capability in terms of ordering from our suppliers and trading with our other significant customers, such as the Ministry of Defense." "With LANSA Integrator we can handle our big customers who prefer traditional EDI, but we can also handle our smaller customers who prefer to send their orders in XML, CSV or even in Excel spreadsheet format," adds Hansford. "We have the flexibility to accept and send business transactions in a variety of formats, using many different communication methods. We have hardly scratched the surface." We have the flexibility to accept and send business transactions in a variety of formats. E.P. Barrus has recently implemented a dealer website built with LANSA's customer self service solution, LANSA Commerce Edition. The site also uses LANSA Integrator to exploit web services offered by Epitomy, a company who specializes in exploded diagrams. Founded in 1917, E.P. Barrus Ltd is a family owned business specializing in the manufacture, distribution and after-sales support of high quality, high performance equipment for defense, industrial, commercial and consumer use. The company is based in Bicester, Oxfordshire in the UK, and employs over 170 staff. E P Barrus uses an iSeries model 620 - 2179 with 90 office users on PC's and NC's plus 30 laptops used by the sales force. The EDI solution is between E P Barrus' System21 software from GEAC, and B&Q's SAP system. B&Q plc is the number one DIY retailer in Europe and the third largest in the world, with more than 65 stores opened internationally, including B&Q Yangpu, in Shanghai, China, which is now the largest B&Q store in the world.